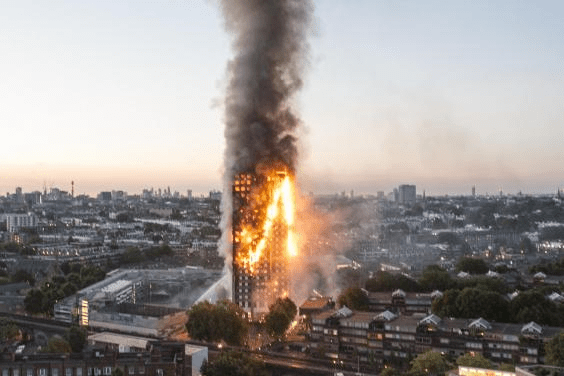 There was no sprinkler system at Grenfell Tower. As a result, when a fire broke out in one of the flats, the whole building went up in flames like a giant matchstick. Lillian Greenwood is right to say Theresa May has reneged on her promise to make tower blocks safer after the Grenfell Tower fire. It is all very well for the minority prime minister to say “there are a number of aspects” to be examined regarding tower block safety, but the simple fact is that several London councils have already been advised to fit sprinklers, and their absence can be remedied easily, while those other aspects are explored. In any case, who relaxed building regulations to ensure that sprinklers weren’t a required safety feature – local councils, or Parliament? So Parliament should foot the bill. If Theresa May can find the money for her deal with the DUP, she can find the money for this. Theresa May has confirmed there will be no Government cash to fit sprinklers in tower blocks, triggering accusations she has broken a promise made after the Grenfell Tower tragedy. It is “up to the council to make decisions”, the Prime Minister told MPs – amid a growing furore over the multi-million pound bills that town halls face. Nottingham, Croydon and Wandsworth have all had multi-million pound requests turned – even after being advised to carry out works by their local fire brigades. Well there must obviously be no profit in sprinklers . if they cannot fill theirs and their mates pockets then it is of no interest to them. she dont care. as far as shes concerned as long as people are dying who are poor etc. shes happy. her policies are working. The May is just a political animal of the Cons oppressive dark forces. Caught bang to rights ignoring the risk of the loss of human lives especially those that are not part of their political leaning. Their famous word pleb keeps coming back and haunting the Cons for what they are really all about. Yet another nail in her political coffin and exposing yet again their habitual short term political lies. Money to buy votes but nothing to save the lives of plebs. and we still don’t know how many people died in the inferno…..and de-regulation started with Michael Heseitine in the 1980’s with self certification by builders and developers in order to reduce and do away with Building Control Officers…..and the regulations were then gradually watered down….and as new materials were developed the essential regulations in using them were not developed…..And they want to de regulate further………. The strength of lobbying by many industries and commercial interests and in some cases local and central government to save profit and costs is endemic. Unfortunately it all comes home to roost when common sense gets overridden by pure industry and government misplaced and rampant greed by manufacturers and installers wanting to get away with what ever saves them money. It seems this community loss has not made much difference to that same Conservative type thinking…….and donations flow for services rendered.